The exclusive and private, Art Nouveau 1915 Fannie Farmer "Weldon" Summer Estate located in Harvard, was greatly restored and renovated to perfection in 2017/18. Exquisite kitchen and bathrooms, 2nd flr add'l laundry, mudroom, reconfigured master with fireplace complete with his/her closets. Estate retains original character with grand entertaining spaces, original millwork, window seats, and hardware. Infrastructure updates includes plumbing, wiring, heat and central A/C, new 6 bedroom septic, SMART sump pump system, frost free hydrant in garden. Property includes 8 +/- acres of land in two parcels on either side of street. 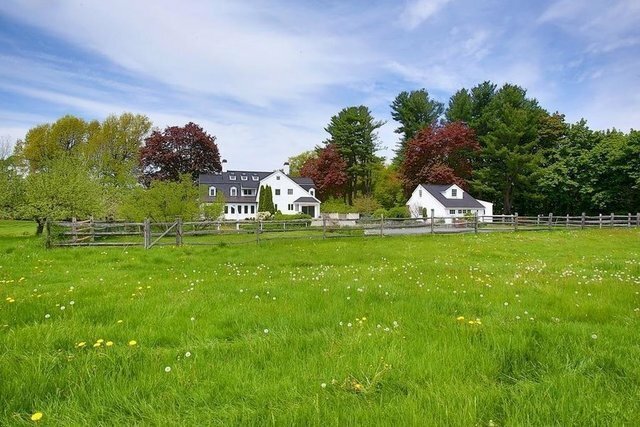 The estate, surrounded by stone walls, has no immediate neighbors as property is surrounded by APR Orchards, mature trees, pasture land, and the estate's perennial gardens bordered by orchards and forest. 3rd floor and cottage/garage approved by BOH as 5th and 6th bedrooms. Original Fannie Farmer kitchen pantry/elevator preserved for buyer.